If you've been following me on Instagram lately, you'll probably know that I got to do a little bit of traveling over these past few weeks. My family and I took a lovely excursion up to Canada where we enjoyed a tour of the Pacific Northwest, visiting Vancouver, then Vancouver Island and finally concluding in Seattle. It was an incredibly fun trip and as always, I made sure to take a lot of pictures along the way. 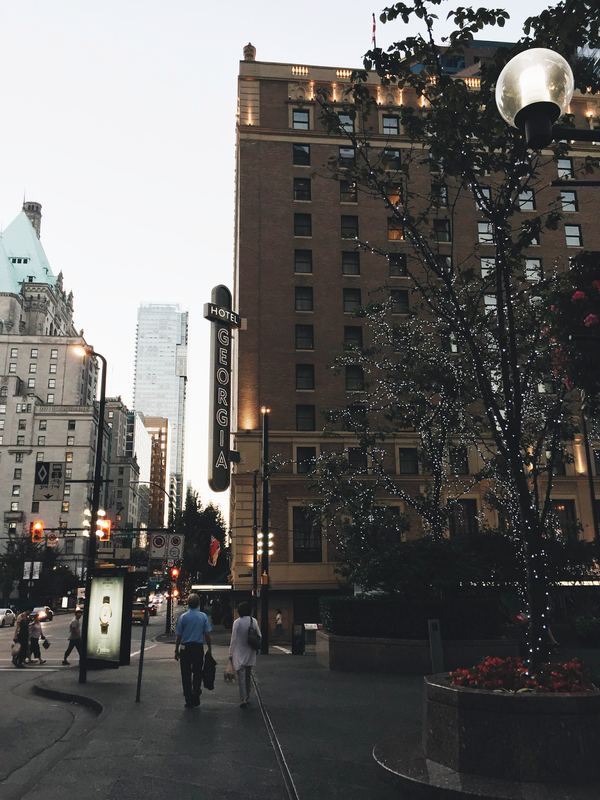 This was my second time visiting Vancouver and just as I did the first time around, I absolutely fell in love with the city. I first visited with Austin last year and I kid you not, we looked into getting permanent residency there after the trip because we loved it that much. The city is perfect in a countless number of ways. It's located right by the seaside, the food (and especially the seafood!) is amazing, it's clean, very urban, lots of shopping, plenty of gorgeous nature, and very friendly people. The stereotype is true, guys - people in Canada are super kind, and I was all for it. After four nights in Vancouver, we took a ferry over to Vancouver Island where we stayed in Victoria for another three nights. I wasn't too sure what to expect of Victoria seeing as I had never really heard of the area before, but I ended up loving it there. It's a small but bustling town that actually reminded me a lot of London. Just like Vancouver, it's nestled in a gorgeous seaside location and the atmosphere is fabulous. It was the perfect combination of rustic meets modern, with a downtown district lined with lively bars, pubs, restaurants, shops and all that fun stuff. Our trip concluded in Seattle, where we only stayed for one night but still got to go out and see a bit of what the city had to offer. Pike Place was a really neat area to visit, and we had dinner at a super great restaurant called The Pink Door. If Italian food is your thing, definitely try that spot out. I'll conclude my segment here and let the photos do the rest of the talking. I'll be visiting Portland next month, so expect another travel diary shortly afterwords! Urban lights from our first night. First breakfast in Vancouver consisted of the typical fashionista diet, aka plenty of coffee and croissants. Taken at a lovely cafe by our hotel called Fauborg. More croissants + coffee because why not. View of Lions Gate Bridge from Prospect Point in Stanley Park. Wagyu beef steak at one of my favorite spots in town, Blue Water Cafe. 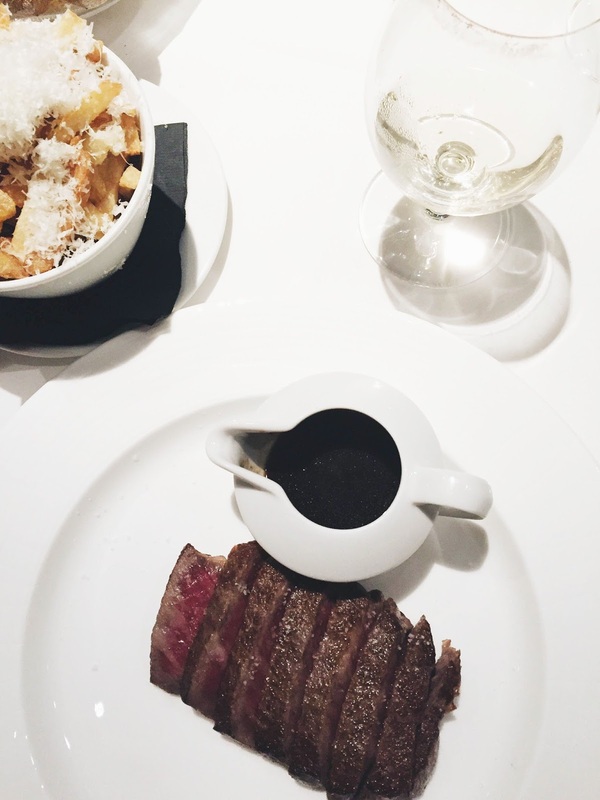 This was hands down the most delicious - and most expensive omg - steak I have ever eaten. Ridiculously good sushi at Miku in Vancouver. 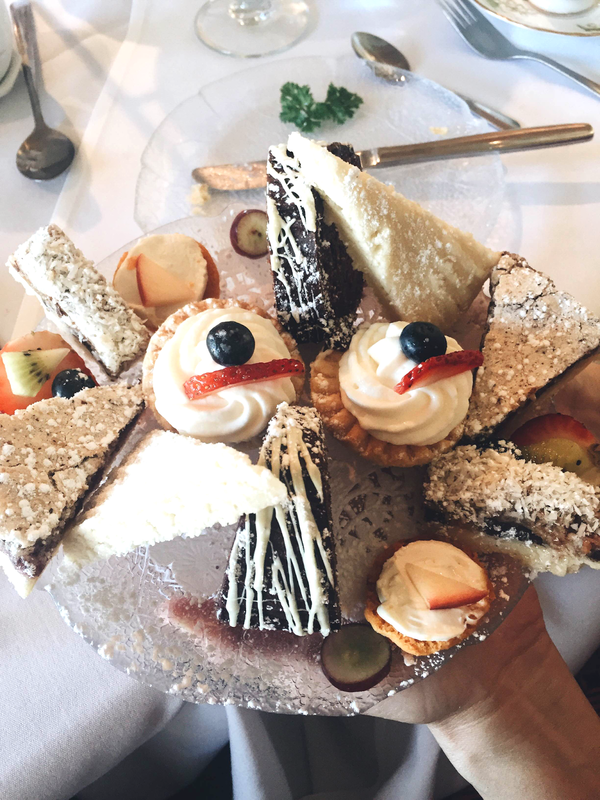 If you're there, get the Premium lunch plate - you'll thank me later. The first skyline views from our harbor dinner cruise. Another view of Lions Gate Bridge, this time basking in the sunset. Shoutout to Vancouver for the aesthetically pleasing sunsets. Reason #47384623782 why Vancouver is perfect: They have a Ladurée. Sooo, I kind of like taking photos of the Vancouver skyline. This was the view of it from Granville Island. About to get on the Capilano Bridge. For someone who is pretty scared of heights, it wasn't really that bad to cross. Ferry from Vancouver to Vancouver Island. ~ferry selfie~ featuring some lovely wind and and even lovelier hair! 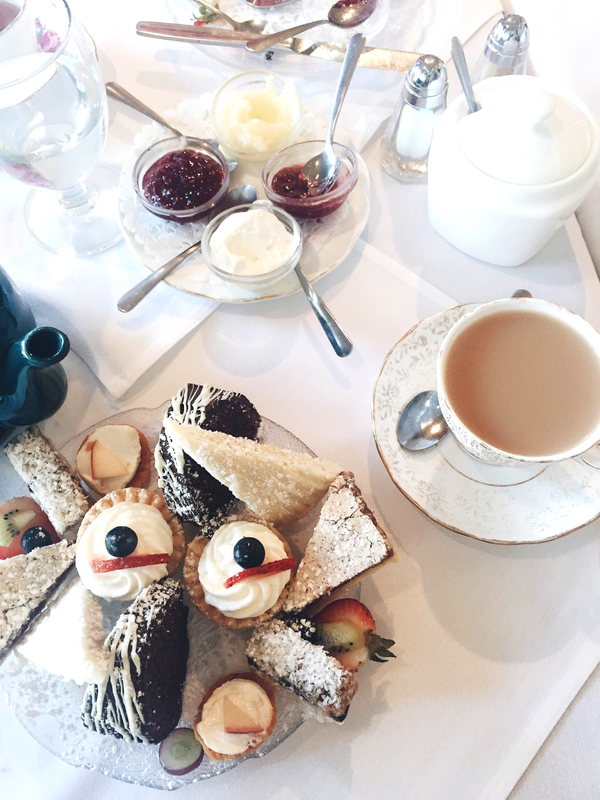 Afternoon tea at White Heather's in Victoria. First night out in Victoria. Such a gorgeous town with quite a lot of European vibes. Roses at Butchart Garden in Vancouver Island - featuring a cute, lil bee. An AMAZING seafood/ Indian fusion dinner I had at Fishhook in Victoria. This is the Daily Khatch with tikka seared tuna. Neon vibes at Pike Place Market. Wow ok, is this post long overdue or what? 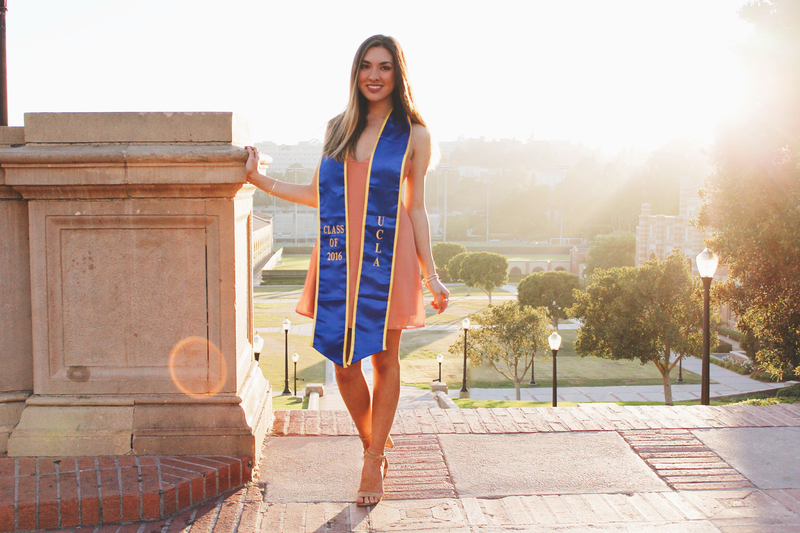 As embarrassingly late as it may be, there was no way that I could graduate and not make a post about both my time at UCLA and the road that I took to get there. I'm officially a college graduate now, and it's a pretty crazy feeling. Emotions since this transition have been a funny cocktail of excited, bittersweet, nervous, and happy, and the time literally could not have flown by any faster. Its been a few months now since graduation happened and I still honestly don't even think the reality has sunk in for me just yet. 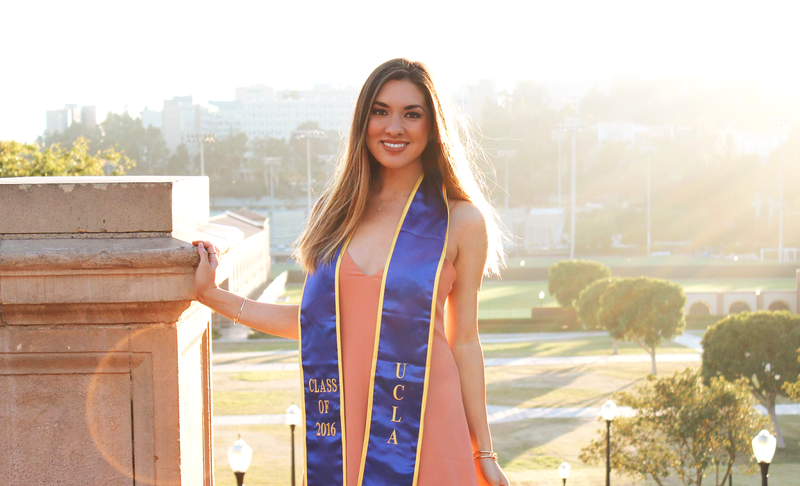 Nevertheless, I couldn't be any more grateful to have attended a school as incredible and inspirational as UCLA. I had the chance to meet a lot of amazing people and professors along the way, and the education I received was one that I'll carry with me for a lifetime. Now, as a newly minted graduate, I figured I would do a little bit of a recap post and share with you guys the story of my experience, ranging from my days at community college all the way to my final graduation. Aside from this throwback post here, I really haven't been all that open about my undergraduate career on this blog, let alone social media in general. Sure, there were a few posts and articles here and there that I put together discussing LA and student life, but I have never really delved too far into my own personal story. I figured that if there is anytime to finally make a post like this, it's now. And just so you know, this is going to be long. You've been warned. For those of you who may not know, I actually transferred to UCLA from a community college. After graduating high school in 2012, I attended my local community college, Cabrillo College, for two years before making the move down to LA and starting up school here. I really can't even begin to describe just how efficiently Cabrillo helped me get onto the road to transfer, and how greatly it strengthened my work ethic and vigor as a student. I'll be elaborating on this a lot more down below, but for now I'll just say that going to Cabrillo allowed me to reinvent myself as a student and approach academics with a new spirit. It helped me upgrade myself from the ok-but-not-amazing student I was in high school to someone who sincerely cared about trying her absolute hardest. Some of the most passionate professors I've ever had the privilege of being taught by were from Cabrillo (my absolute favorites had to be Charlotte Morrison and Kim Cardilla! ), and I also got to meet some pretty awesome, brilliant people along the way. Choosing to go to community college was one of the best academic decisions I have ever made for myself, and while I'm on the subject, I might as well also say that it's important to never allow somebody to shame you for making that same decision. I'm fully aware of the somewhat questionable stigma that can come with going to community college, with some thinking that it's not real college, that it's the "easy way out" or that it's basically some sort of joke. The problem with this stigma however is the fact that that it's completely, 100% not true. Community college is entirely what you make of it, and amazing things can happen when you work hard. It's is an incredible resource, and it would be silly to not take it if it's something you are considering. My boyfriend and and I were long distance at the time, and he actually went to UCLA straight away as a college freshman while I stayed in town to attend Cabrillo. We started dating in our senior year of high school and we ended up doing two years of long distance following our high school graduation, which, when looking back on the experience overall, ended up being not that difficult. It obviously got a bit tough and lonely every now and then, seeing as it was a huge transition that I don't think anybody is ever truly prepared for the first time around. But in the end, things really could not have worked out any better and I'm incredibly thankful to have gone through the experience overall. 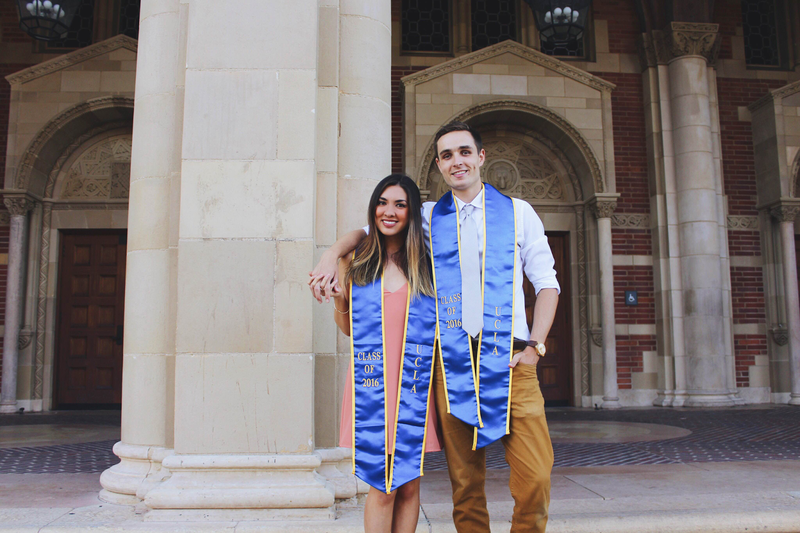 Not only do I feel like it both tested and strengthened our relationship, but it also opened my eyes to how much I loved the UCLA campus, motivating me to apply in the first place! During this period of long distance, I visited him at school frequently and I absolutely loved what I saw - the campus itself was gorgeous, and it was located in a great neighborhood near areas such as Beverly Hills, Santa Monica, Venice, and Malibu. Each visit had me falling more and more in love with the city, which is no surprise seeing as I have always found myself to be a city girl at heart. I do get asked about long distance every now and then and what the experience is like, so I figured I would dedicate a portion of this post to share my thoughts on it. Although long distance is not always a favorable option for a couple, I feel like my experience in particular ended up being a lot more positive than it was negative. I will admit that I was pretty terrified of the thought at first, with the first few months in particular being difficult to adjust to. I'm already an anxious person to begin with, and this drastic shift in my life naturally made my anxiety go into overdrive at times. Yet despite the difficulties that the first stretch of this transition brought onto me, I'm grateful that I went through it all, just as I am with any other challenge that I have both experienced and ultimately grown from. Because through that first initial struggle, and over the entire course of the two years in general that we were long distance, I indeed found myself growing as both a girlfriend and as my own self. Both Austin and I grew immensely from this experience. We each started off as little kids with a lot to learn, and the two years that followed shaped us in ways that were necessary for us both as a couple and for our own individual selves. Austin matured into the man that had been aching to come out for a long time, while I finally gained some confidence in myself and stepped up as a stronger, less feeble and more grounded individual. I think it's incredibly important in a relationship that both parties become better people out of it, and that's exactly what happened in our situation. Some general tips on how to make getting by on the daily easier include constant communication, Skype calls, phone calls and of course visits when you can! Thankfully I was only an hour long plane ride away, and Austin was able to visit back home frequently as well. Making time for visits not only makes the time fly by faster, but also makes you a lot more appreciative of the time that you two actually get to spend together. An example of this aforementioned growth was my willingness to take an incredibly bold move and apply to a university that was both super competitive and one that I would have never thought I could actually get into. UCLA was the only school I applied to, and I initially had a lot of doubt towards getting in. Prior to making this decision, my plan post-Cabrillo was originally to transfer to Santa Monica College for more units and a higher GPA, in hopes that this move would make me a more competitive applicant. It wasn't until a few months before the applications were due that I actually decided to try to get in straight off the bat, which was definitely a nerve-wracking decision. Not only was I trying to get into the most applied-to school in the nation, but I was also trying to get into one of the most competitive and impacted majors the university had to offer - Communication Studies. My GPA was only a little bit over the minimum to simply apply for Comm, and my extracurricular activities list was rather modest. Regardless, I took a leap of faith, applied and hoped for the best. I'll forever be thankful to both the help of my guidance counselor and Austin, who both really encouraged me to apply even if I felt like my chances were slim. Without their push, I know it would've been a lot harder for me to convince myself that I actually had a shot and go for it. Once I decided that I was seriously going to apply to UCLA, my drive as a student increased like crazy. I joined the campus newspaper to write articles on fashion and student style, I took on a second job at the retailer Express to show that I was actually working with fashion, and I made sure that my academics were going as strong as they could be. Fast forward to the following April, which also happened to be during Coachella 2014. I was attending Weekend Two with Austin and a few friends, but was also nervously anticipating a decision letter to pop up in my email at any moment. This trip ended up aligning right with the time that the decisions would be sent out for transfers, and I constantly found myself checking my phone for the letter that would determine my academic fate for the rest of the year. On the Saturday night of that weekend, I mindlessly decided to check my email for the millionth time in a row, not actually expecting anything new to show up. And of course, it was in that moment that I least expected it, that the email I had anxiously been waiting months to receive popped up in my inbox. I remember my stomach flipped, my hands started shaking, and my heart started beating rapidly as I scrambled my fingers to open up the message but of course, that also happened to be when my phone decided to stop receiving service out of nowhere. I panicked and turned to Austin in a hysterical mess trying to use his phone instead, and thankfully his was able to work just fine. After aggressively logging into my email like a madman, opening up the message and waiting for what seemed like a century of loading, I found myself looking down at the letter that I had only ever dreamed of receiving. I saw a "Congratulations!" along with my name listed right there, and I was in complete shock. It was one of the happiest and craziest moments of my life, and I'll never forget that feeling. I told Austin, I called my parents and then I danced the night away to Kid Cudi, MGMT and all the other wonderful artists that came afterwords. I really couldn't have asked for a better way to end that day, or a better introduction into the Bruin family. This acceptance was especially valuable to me, not only because I tried my absolute hardest in community college but also because it wiped away a good number of academic insecurities that I had previously held in high school. Because back then, I really did feel at times like I hadn't made many accomplishments and that there wasn't anything I truly excelled at. This was especially prevalent in my senior year, when many of my fellow peers, including Austin, were applying to college. There were athletes, kids who had really high grades, students who went through life-changing experiences, kids who were exceptionally talented at a certain skillset, kids who were in countless clubs and participated in numerous extracurriculars and so on. I didn't really have any of these. I felt a weird, unsettling sense of average. An uncomfortable "in between" feeling, if you will, where I wasn't doing bad at all but there also wasn't anything in particular that I really stood out with. While I already knew in my senior year that I would be going straight to community college and didn't actually have to write a personal statement, I remember being discouraged at the idea that I wouldn't have had anything to write if I had hypothetically done one. Never did I realize that my long-held interest in fashion was something worth writing about. At the time, my knowledge of working in fashion basically revolved around what I had seen in The Devil Wears Prada. This was also four years ago, back when I was not all that familiar with the realm of fashion blogging or any bloggers in general. I remember thinking, quite disappointingly, that my interest in fashion seemed somewhat mundane and trivial compared to the more "ambitious" passions that were out there, such as a leadership role or engineering. Going back to The Devil Wears Prada, I was being warped into the stigma that Andy expressed when she referred to the highly detailed professionalism and relevance of the fashion industry as "this stuff." I obviously know now that this sort of label is both wrong and super subjective. I also know now that constant comparison to others is a foul-proof recipe for disappointment and that you should always just focus on your own journey. But this is high school we're talking about - a time during which a lot of us were probably ridden with insecurity and self doubt. I never really had the realization that maybe, just maybe, a school would take this interest seriously until the end of my senior year when I had to write a mock personal statement about myself for my literature class. I decided to go with my gut and write about fashion. I literally wrote the same exact thing I just mentioned here for that assignment, where I felt like I didn't have any impressive skillets or talents but at the very least, I cared a lot about fashion. Little did I know that I would be doing the same exact thing two years later, except this time, it would be for real. 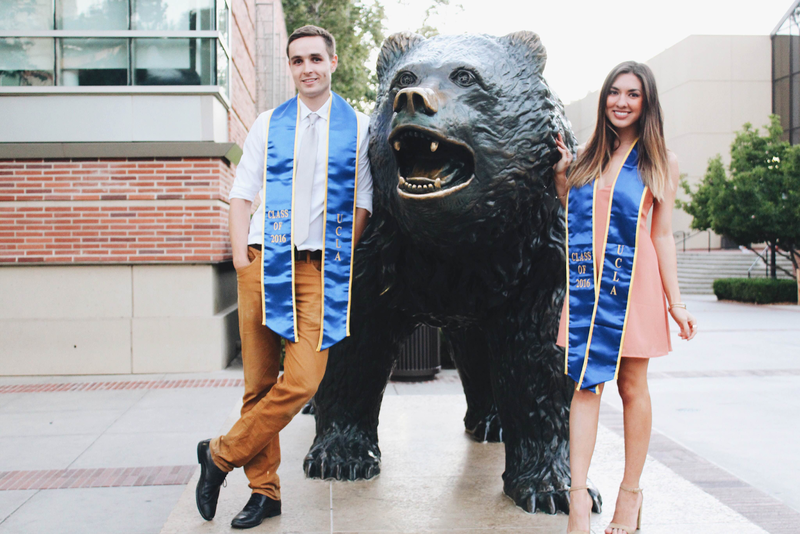 Both of my personal statements to UCLA revolved around my interest in fashion, and I was initially concerned that writing about that topic for something as academic-based as a college application would be a risky move. I contemplated writing about other topics but in the end, I realized I couldn't BS myself like that. The truth of the matter was that I loved fashion, and that it is what I was truly passionate about. I wasn't saving lives with this interest. I wasn't exactly making a huge difference in the world through it. I didn't have to take tests or do rigorous coursework for it. But it was something I deeply cared about, and something that I felt was important enough to serve as a representation of myself in my college application. Passion will always shine through, and that is something that I still hold to heart very dearly to this day. With that said, I hope you never get discouraged about having a passion that may not seem ideal or serious to others. Don't allow the ignorance of others or unhealthy comparison discourage you from pursuing what it is you truly want to accomplish. As long as you're passionate about it and it doesn't hurt people, I really don't see why you shouldn't go after whatever it is you want to do in your own life. There's a quote by Sofia Coppola that has resonated strongly with me, in which she states "You're considered superficial and silly if you are interested in fashion, but I think you can be substantial and still be interested in frivolity." I couldn't agree anymore with that sentiment, and it's not just because she also happens to be my favorite director of all time (Lost In Translation will forever be one of my favorite films). It's because it's true, and what better person to say that than someone as accomplished, talented and, of course, stylish as Coppola herself. I'm actually pretty disappointed in myself for not being as confident with my interest in fashion as I am now. It is incredibly outdated to think that fashion is not a serious career choice, especially with the drastic rise of social media and digital marketing these past few years. Anybody who thinks that fashion is not considered a serious, professional field and is nothing more than a mere game of dress-up for people who are vain and self absorbed has a severely flawed understanding of fashion.There are countless smart, successful and powerful women out there who have made a career for themselves within the industry (especially bloggers!) and these are the women that I look up to everyday. Another important lesson I learned is one that I think will be relevant for a while, particularly in my 20's. It's the importance of going at your own speed and taking the time you need to accomplish whatever it is you want to do. This was something that I definitely needed to tell my 18 year old self, seeing as I first started community college in a bit of a discouraged state. This obviously hit me hardest with Austin, who left for LA right before our one year anniversary rolled around. While he got to move to a big, new city and dip his feet into an ocean of exciting new opportunities, I was left in the same, old town doing the same, old thing, all while missing him terribly. I was obviously happy for him and this new phase of his life that he was entering, but there was no denying the fact that I was crushed over the distance. But looking back now, I would not have had it any other way! As mentioned earlier, going to community college was hands down the best decision I made for myself as a student. Even though going there meant that it would take me longer to move out and enter this new phase for myself, it was 100% worth the wait. Taking my time was exactly what I needed to get myself on track and achieve the goals that I always knew I was capable of accomplishing. I highly doubt I would've gotten into UCLA had it not been for Cabrillo, and I am forever grateful for both the opportunities and personal growth I was able to experience while I was there. I developed a much better understanding of what I wanted to pursue as a student, I chose a major I felt confident in and I was able to get some real experience with Communications-related extracurriculars. You'd be surprised at all of the amazing things you are able to accomplish if you really just set your mind to it. Never feel bad for taking longer than others to accomplish what it is you want to do in life, because that extra time and dedication you give to yourself will definitely be worth it in the end. Whether it's transferring to a four year university or even getting a job following graduation, don't worry about what everyone else is doing and just do you. You know what will work best for you, and how to get yourself there. These are all just some valuable pointers that I have picked up along the way and found to be both helpful and comforting. And who knows, maybe they can work out nicely for you as well. I'm not a fan of unsolicited advice, so please don't think I'm trying to tell you the best way to live your life, because I certainly wouldn't know - I'm still trying to figure out my own! This is all simply just one graduate's experience. Do what you will with this information, but I do hope it proves to be helpful in one way or another! Another highlight of my UCLA experience was the fact that I got introduced to a huge community of fashionista's just like myself - something that I had never really experienced prior to my move down to Los Angeles. This was made possible through my internship with the fashion website College Fashionista, and my time with them not only introduced me to the stylish girls of my own school but also allowed me to participate in some rad brand collaborations. It welcomed me into a whole new community of Fashionista's/Fashionisto's from literally all across the country who were my same age and shared the same passions/ interests as I do, and that in itself was very inspiring and enriching. I also joined an online campus magazine called Denizen, which was another fun and enriching experience. Once again, it introduced me to some fabulous fellow peers of mine and gave me the opportunity to contribute articles on fashion to a wider audience, which has always been a great interest of mine. I moved into my very first apartment when starting up school here and got introduced to all of the perks and downfalls to living on your own, with my favorite being that you can eat ice cream for breakfast and no one's going to judge you and my least favorite being that I missed my dog terribly the first year and a half. I lived with Austin and our friends Carlos and Chuy during the first year, while the second year was just me and Austin. Both were very different experiences in their own ways, but I still had an overall great time in each one. Graduation snuck up fast, but it sadly did not arrive without tragedy. As many of you may have heard, we had a horrible murder-suicide happen on our campus about a week prior to graduation. I was about a mile away from campus in my apartment studying for a final that I had later on that evening, when I suddenly received a Bruin Alert text on my phone of a shooting that had happened on campus. I will never forget the deep sense of terror I felt as I began to see panicked messages and status updates from my friends and fellow peers pop up on Facebook, with rumors of an active shooter beginning to swirl around as well. There were nonstop police sirens and helicopters flying over my neighborhood, and it was just overall a very traumatic, horrible day. You really do not think this kind of event, that you see happen all the time on the news, could ever actually occur at your own school. And it's an incredibly unsettling feeling knowing that these awful events can happen literally anywhere, at anytime. School shootings, and mass shootings in general, are both a tragic and disturbing reality in this country that have been happening for far too long now, and it really does make me wonder how many more lives it's going to take before a real, effective change is put in to place. Professor Klug was remembered during both of my graduation ceremonies and a candlelight vigil was held for him as well, which I found to be a touching and heartfelt way to move on from this tragedy. On a happier note, graduation was a really exciting and bittersweet moment for me. And again, it snuck up SO fast! The ceremonies themselves were incredibly well assembled and quite the production. Just as new students are brought in with open arms, orientations and numerous rounds of welcoming activities, graduates are sent off with a large, gorgeous ceremony just as impressive. Both my family and Austin's came into town for the weekend and we all got to hang out, enjoy grad festivities and explore parts of LA itself. My mom put together the loveliest graduation dinner for me at Bar Hayama in Sawtelle and we all went over to DTLA the next day to consume our body weight in tacos at Tacolandia. Seeing as everything was free and it was all you can eat from what seemed like an endless supply of vendors, I ended up eating way too much too quickly. By the time I got through maybe a 1/3 of the vendors, I was already way too full....but I certainly enjoyed what I did get to try. Austin and I will be going to an all you can eat/ drink beer and tator tot festival next month so I'll have to take on a better approach next time. My friend Antoinette and I at our Communication Studies departmental graduation ceremony. As for my post-grad plans, Austin and I will be staying in LA and be like, actual working adults here. And just like with graduation, emotions are once again a combination of nervousness, anticipation and excitement. I would imagine most college graduates have that weird sense of disillusionment for a bit when they realize they're no longer a student and are now out in the ~real world~ which is honestly kind of how I have been feeling lately. I mean, I've pretty much been a student for, what, fifteen, sixteen years now? It's definitely a weird feeling to suddenly no longer be that anymore, but I'm still excited for what lays ahead. And what better place to explore it in than in the City of Angels! We just moved out of Westwood and into our new neighborhood for the next year, which is around the Culver City/ Mar Vista area. Venice Beach is only a short drive away, and I'm now walking distance to my all-time favorite restaurant: Rutts! It's going to be pretty difficult controlling my urge to want to go there literally every weekend but hopefully I'll be able to manage. This is going to the third apartment we've moved into in the past two years, but the transitions really haven't been all that hectic - if anything, its been pretty cool being able to start fresh in new places and redesign my living spaces to my liking. For someone who is as obsessed with #aesthetic as I am and is in a constant state of inspiration cycling, it can actually be a bit necessary at times. I'll make sure to do an interior design post once I'm all moved in and set up to show you guys how I went about styling my new place. Whew. Okay. That was a lot. If you're still reading this, thank you for your continued attention! Since I've been rambling on for so long, I'll keep this closing segment sweet, simple and concise. Overall, my time at UCLA was absolutely incredible. I'll forever be appreciative of the time I spent there, the education I received, the experiences I went through and the people I met, and I'll forever be proud to be a part of the Bruin family. I'll always be thankful of the road that I took to get there, and everything that I went through during those two years that undoubtedly helped shape me into who the person I am today. I'm thankful that this school accepted me for the passion that I truly loved rather than for a lackluster one that may have looked better on paper. This acceptance and overall experience is one that will continue to encourage me to pursue the passions that I hold dearly, and I'm thrilled to see where this pursuance will take me. I'll be picking up my diploma next week, finalizing the last step of this wonderful road that I've been on for the past two years. With that said, however, it's ultimately time to move onto the next chapter. Here's to the future, and the exciting journey that lays ahead. Rocking a high end look without having to pay the high end price is probably one of the best combinations a fashionista can make for herself. I absolutely love putting together outfits using garments that are from more affordable retailers, with a good chunk of my clothing coming from Target, Brandy Melville, SheIn, Forever 21 and so on. I can't even tell you guys the number of times I have been asked where I got a certain article of clothing, only to surprise them by mentioning one of the aforementioned sources! Style and an expensive price tag do not have to go hand in hand. SheIn is a particularly great source for affordable fashion, so I've gone ahead and put together another wishlist for you guys featuring pieces that flaunt an ultra luxe feel to them, yet are offered at prices that are unbeatable. I wanted to feature a lot of silky pieces in this list, as I am a huge fan of the trend and find them to be the easiest way to incorporate a hint of luxury into your look. I love the juxtaposition with silk slip dresses in particular - the slip shape makes the dress easy and casual, while the gorgeous sheen of the fabric gives the outfit a glamorous feel. Silky pieces are still incredibly popular at the moment, so I hope you guys enjoy these style deals. I was able to find a little corner of SheIn that housed a cute collection of silky & satin pieces, which you can shop below. I also featured my signature go-to block heels, a couple fabulous rompers and a killer off-the-shoulder bodysuit. They've got some pretty great sales going on at the moment, so make sure to use them while you can. Enjoy! I recently got the opportunity to check out the site Sammy Dress and participate in their product experience program, in which I review how the ordering process went and my overall experience with the site. Sammy Dress is an online store that offers a wide array of clothing for super affordable prices, and I couldn't have been any more excited to find my beloved aforementioned stripes on a number of the pieces they offered. When I submitted my order, I received an email shortly afterwords confirming my purchase and that my items were being processed. I actually had my pieces sent to my parent's home rather than my apartment, since I knew in about a week's time from ordering, I would be there instead. By the time I got to my parent's place, my pieces were right there waiting for me! I ordered three pieces overall: 1) a striped blouse, 2) a striped crop top and wrap skirt set, and 3) a double buckle belt. They were all individually wrapped, as shown below, and did not appear to have any stains, loose pieces or broken bits on them. The material of the blouse is a bit on the thinner side, but it worked out pretty well for me seeing as living in LA is essentially living in a never-ending summer. The belt was actually a bit too large to fit through the loops of the jeans I was wearing here, so I ended up just wearing it over it instead. I ordered a size S for the tie-front blouse and two piece, and they both ended up fitting perfectly. The two piece is something I can definitely see myself rocking on a warm day out, while the belt is a statement accessory that can easily edge up any look. The wrap skirt that comes with the two piece is pretty good quality, and it allows you to customize the placement of the skirt's slit and how fitted you would like it be on you. The material is a little thin, but thicker than that of the first blouse. Again, though, it's probably for the best seeing as these are pieces designed for warmer weather, and you certainly wouldn't want to be wearing a thick, stuffy garment out in the sun. The double-buckle, Western-style belt is also very trendy at the moment, and this piece in particular is refreshingly affordable compared to the other pricier options on the market. I would suggest keeping everything else simple when donning this extravagant accessory, which I did here by keeping the rest of my ensemble all black. However, if you decide to rock a print with it, I would recommend pairing it with the clean stripes you see in the first look. I actually paired a similar style belt with the first look rather than with the one I received from Sammy Dress, as the latter was too large to fit around my waist and was most likely designed to be worn as just a regular belt around the hips. 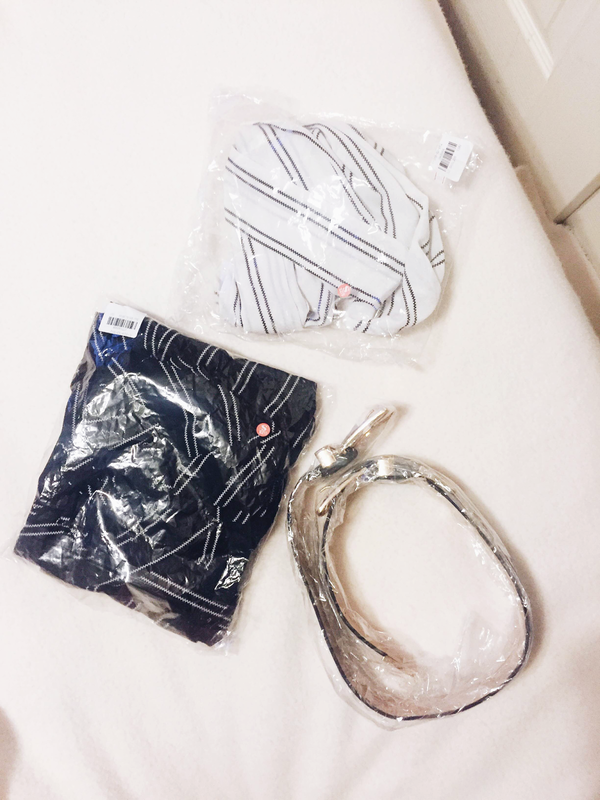 Overall, I had a pleasant experience with Sammy Dress and really liked the pieces I received. The shipping was fast and there didn't seem to be any complications or mix-ups in the ordering process. 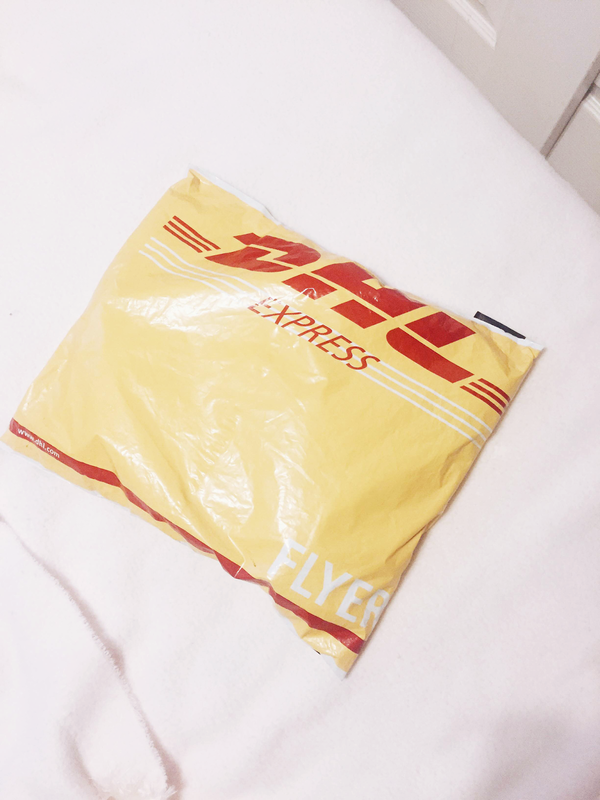 Customer service was friendly, everything arrived as expected, and I definitely plan on rocking the pieces I received in future outfits. My favorite item out of all of these would definitely have to be the tie-front blouse, as you can probably tell by the excessive number of photos I've featured of it. Check out what they have to offer over at sammydress.com! Now, a bit of an update on my personal life as of lately: Austin and I are currently in the middle of dogsitting, housesitting and moving into our new apartment so things have been pretty hectic! We recently got all of the heavy stuff moved into the new place so I'm glad that's over with, but I'm definitely still feeling the soreness to this day. I suppose that's what I got for being pretty lazy with workouts haha. This is the second year in a row that we've moved apartments and everything that's inside of them entirely by ourselves. While the initial moving process can be a bit intense, the ability to completely redesign everything afterwords and update your living area always makes it worth it! I'm pretty excited for setting up this new place - it's a studio, so it's technically a bit smaller than what we have been living in previously, but it's actually quite spacious for a studio. And you know I've been searching through Pinterest picking up some tips on how to style a studio apartment fabulously. I also finally have a graduation recap coming up next for you guys. Yes, I know it has literally been months since I've saying that, so please pardon the embarrassingly late delay. It will be up in just a few days - hope you guys like what you see!